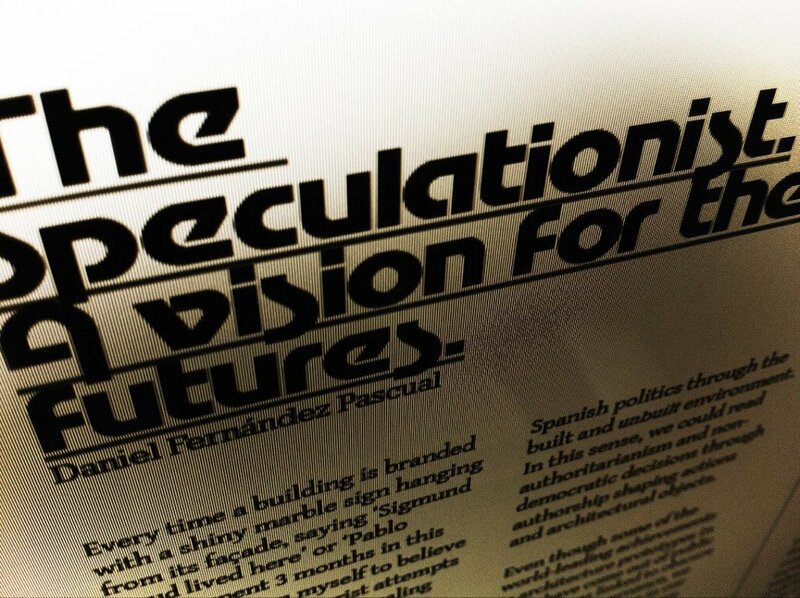 As part of Orwellian, curated by dpr-barcelona. 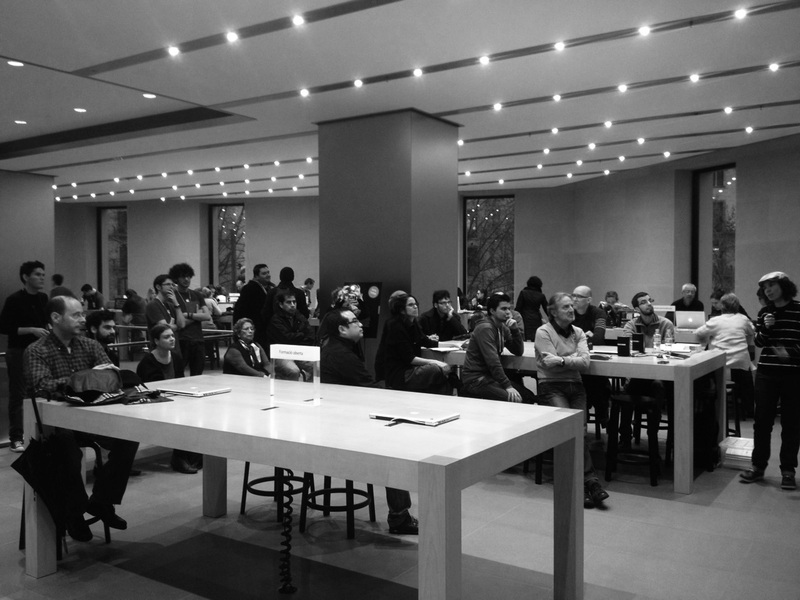 Launched at Apple Store Passeig de Gràcia. Barcelona, 28 Feb 2013. Every time a building is branded with a shiny marble sign hanging from its façade, saying ‘Sigmund Freud lived here’ or ‘Pablo Picasso spent 3 months in this house’, I resign myself to believe it. These retro-futurist attempts of gentrification by revealing the ins and outs of a building could also inspire new modes of ‘conflict tourism’ in these days of crisis. The same messages could mutate into ‘3,000,000 € of public money were spent here’ or ‘nobody has been living in this house for 4 years 3 months and 23 days’ or ‘5 people have so far been evicted from this site’. This is the kind of morbid news that contemporary urban residents or visitors would like (need?) to hear. 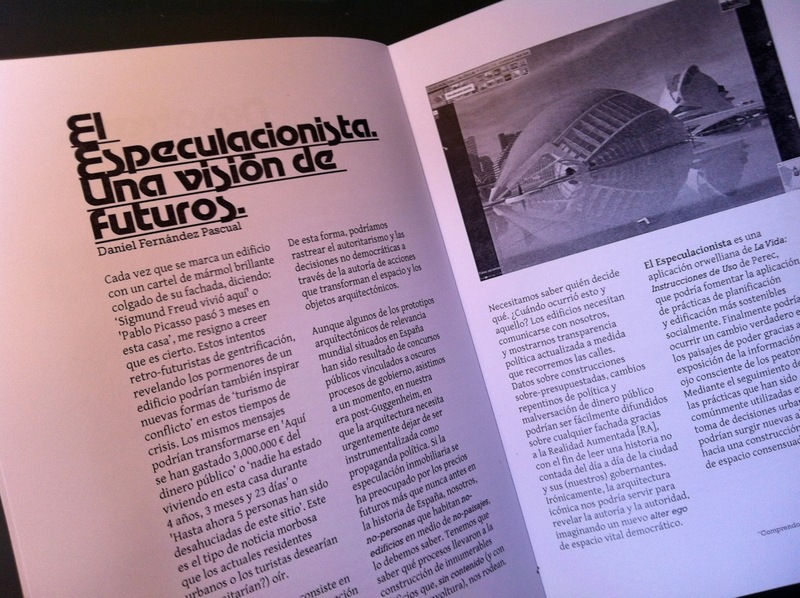 The Speculationist consists of making a layer of information visible and accessible to the general public, in order to track Spanish politics through the built and unbuilt environment. In this sense, we could read authoritarianism and non-democratic decisions through authorship shaping actions and architectural objects. Even though some of the world-leading achievements in architecture prototypes in Spain have come out of public competitions linked to obscure processes of governance, we are assisting to a time in our Post-Guggenheim era where Architecture urgently needs to stop being instrumentalized for political propaganda. If real estate speculation has been concerned about the prices of the futures more than ever before in the history of Spain, we, unpersons inhabiting unbuildings amidst unlandscapes, need to know. We need to know what processes led to the construction of the countless buildings without content (and superb envelope) that surround us. We need to know who decided what. When did this and that happen? Buildings need to communicate with us, and teach us updated political transparency as we navigate the streets. 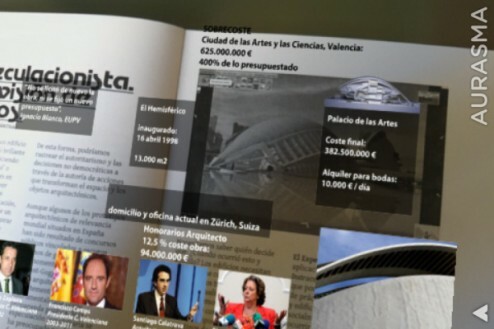 Facts about over-budgeted constructions, incidental policy changes and embezzlement of public money could be easily advertised over any façade thanks to AR, in order to read an untold everyday history of the city and its (our) rulers. Ironically, iconic architecture could serve us to disentangle authority and authorship by imagining a new alter ego of democratic living space. The Speculationist is an Orwellian application of Perec’s Life: A User’s Manual, which could promote the implementation of more socially sustainable building and planning practices. A veritable shift in landscapes of power can finally happen thanks to the exposure of information to a more aware pedestrian-eye. By tracking practices that have been commonly use in city-making, new alliances will emerge towards a collective construction of consensual space.